Assume that you don’t know what the population standard deviation is. You draw a sample of 30 screws and calculate their mean length. 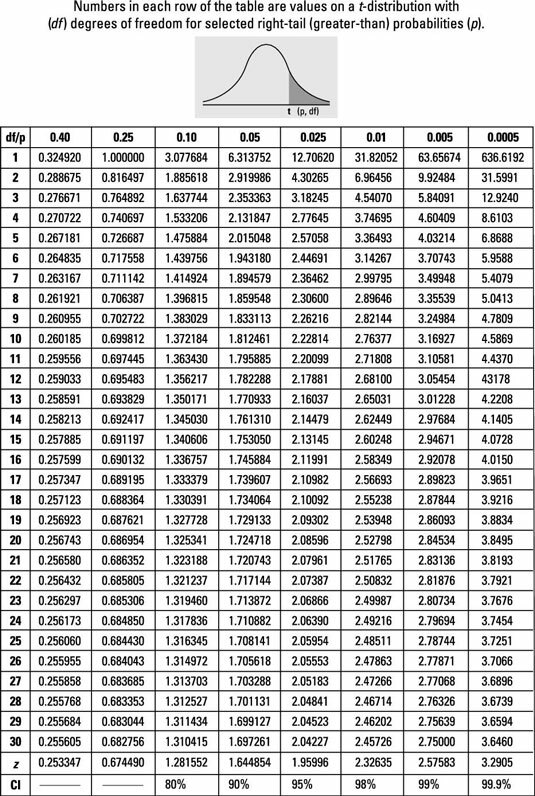 The mean for your sample is 4.8, and the standard deviation of your sample (s) is 0.4 centimeters. What is the 95% confidence interval for the population mean? Round your answer to two decimal places. is 4.8; the sample standard deviation, s, is 0.4; the sample size, n, is 30; and the degrees of freedom, n – 1, is 29. That means tn – 1 = 2.05. Rounded to two decimal places, the answer is 4.65 to 4.95. What is the 90% confidence interval for the population mean? Round your answer to two decimal places. 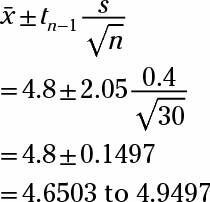 is 4.8; the sample standard deviation, s, is 0.4; the sample size, n, is 30; and the degrees of freedom, n – 1, is 29. That means that tn – 1 = 1.70. Rounded to two decimal places, the answer is 4.68 to 4.92.